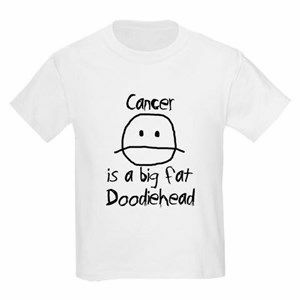 I'm still in the south this week - my daughter-in-law just left for her bi-weekly chemo....she wore her new tshirt....gets the point across, doesn't it? Yes it does, and I like her attitude. Sending good thoughts her way. Aww. Bless her: A wonderful little Person. One of my sister-in-laws, one of the kindest, most helpful people I've ever been around, found out suddenly a few weeks ago that she has leukemia. It's been tough on them, their marriage, the extended family, their kids, their income, and every aspect of their lives. Prayers and good thoughts go to your daughter-in-law. She's lucky to have someone that cares enough to go through travel hassles and all that for her. It gets the point across 100%, will definitely get people to stop and read her shirt. I wish her a speedy recovery from the disease. Bless her. Indeed a strong message. Updating this as many have asked how my daughter-in-law is doing. Sometimes attitude can only take you so far....yesterday we moved from treatment to in-home hospice Time is limited for all of us - quality of that time is critical. No telling how long she has left - but they will be pain-free weeks or months. I've been here (Atlanta) helping out again but going home next week when another family member will be here for support. Been through several crises this past week - I need to go home for a while and see my dog. Kay; I don't really know you...just from reading your posts. But I suspect you are a magnificent mother. I'm very sorry for your pain. All the best, Kay. Hope you manage to get some rest. Lost for words. :-( So sorry, Kay. That's horrible and brutal and soul crushing. My thoughts to not only you, but your son and his family. Kay, Sorry that y'all are having to go through this. Take care of yourself. Hang in there. Our thoughts and prayers are with you and yours. So sorry to hear about this Kay. Positive thoughts heading your way for you and your family. Kay so sorry to hear this the poor kid. Keep strong prayers for you and your family. Thoughts and prayers are with your daughter-in-law as well as you and all the family. I have been through a few of these in the last few years and I can't say enough good things about the in-home hospice care. My best mate is undergoing chemo for lymphoma right now so I can only imagine the anguish you feel. I will visit him in the next week or so. My thoughts are with you at this sad time. It's my first experience with hospice though I've lost friends to cancer in the past. What almost broke me was seeing my big tough son in tears over how caring and helpful the hospice people were. We honestly didn't know this help would be so 'big' and he had no idea it was help he didn't have to pay for. That was a shock for him. It takes very special people to do the hospice work - I'm in awe of them. Thank you all for your thoughts and prayers. I'm sorry to hear about the troubles you and your family are going through. Sending her lots of love and prayers. Hope things are going well. I'm really at a loss for how to respond to this, Kay, but you know you and your family have all my empathy right now. I hope for a peaceful transition for your daughter-in-law, as well as the rest of you, who are probably more disoriented than she is over this blow. Make sure you are getting what you need to dispel the stress. Feel free to give me a shout if you have anything you need to talk about that I might be of help with. Laura's life story ended today - but she will be remembered by family and so many friends. Thank you all so much for your kind words - I appreciate the support. Sorry to hear that Kay. Kay sorry to hear this. She was lucky to have family like you willing and able to go help as she needed it. I'm so sorry Kay. Many thoughts and prayers for you and your family. We're all here if you need anything. Deepest sympathies to you and the rest of your tribe for your loss. My dad was diagnosed with cancer last November and went through the usual treatments but was informed a few weeks back that it had now become incurable and to prepare for the end. Mum has been doing the best she can for him, but it got too much for her, even with everyone else pitching in. He was transported to a palliative care unit yesterday. It's now just a matter of time. It might be days, it might be weeks, but it's unlikely to be months. He'd always been a solid block of a man. Not fat, but not the sort of person you'd pick a fight with. He was still that way after he was diagnosed through Christmas and New Year up until about mid February. Since then he's deteriorated rapidly. He now resembles one of those poor souls we've all seen in documentaries about the concentration camps. Like I said, it's now just a matter of time until the inevitable. Anyway, I didn't mean to hijack this thread. I guess it's just my way of saying I know exactly what you've been through with your daughter in law. You didn't hijack at all - so many people go through this. It's best for your Mum that she can visit in a care facility rather than take on full caregiver position. It's not only emotional strength, but physical strength, that's required. That's why I've not been in Atlanta in the past month - I wasn't strong enough to lift Laura when we reached that point. Her brother was able to stay with them for the last few weeks. The disease and story are part of many families and every situation is different....and none of them are easy. When the outcome is no longer in question - best thing you can do is support your Mother and make sure she's ok. I know you'll do that. It's best for your Mum that she can visit in a care facility rather than take on full caregiver position. Yes, she can not only visit, she can stay overnight with him if needed. As far as looking after her, that's guaranteed. Terrible news. Words never seem enough, but I'm very sorry for your and your son's loss. There's nothing I can say to relieve your feelings, Kay - but my hand is on your shoulder. Just returned last night after getting through the memorial service and the gatherings of family and friends. So many people came I was amazed at the number of friends she had. Thank you all for your kind words - going to close the thread so it doesn't become a spam fest.